This is an article intended for those who only own the Dominion base game and want an overall strategic overview of the game. It is assumed that you have played enough games of Dominion to have a general understanding of how to play the game: the guide is intended for those who are new to the game but have an idea about what all the cards do. It is comprehensive but not complete; although the core principles of the game are found here, there is no substitute for actually playing the game and getting a feel for how the cards interact with each other. This guide will outline the general principles of Dominion strategy, and it is up to you to play them and adapt them to your unique situation. Other good articles for those new to Dominion include Your Guide to Beating Attacks, by the game’s designer, and Building the First Game Engine, an analysis of the “First Game” recommended set. People often ask, “Should I buy Dominion or Intrigue if I’m just starting out?” I always recommend starting with the base game. 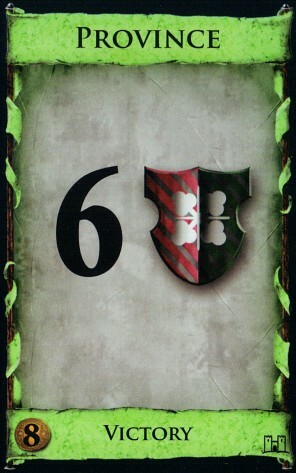 The core principles of Dominion are all found here, and in their purest form: the Cursing attack (Witch), the trasher (Chapel), the +Actions (Village), the trash-for-benefit (Moneylender, Mine), the big deck strategy (Gardens), the handsize-decreasing attack (Militia), and the deck inspection attack (Spy, Thief). This guide is divided into three sections: Set Analysis, Deck-Building and Playing the Game. 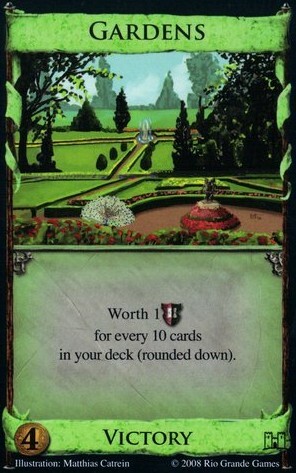 The three most important cards to look for in a given set of Kingdom cards are Gardens (with Workshop), Chapel, and Witch. The presence of any of them greatly alters the dynamics of the game. Of those three, Workshop/Gardens is a strategy unto itself; the other two are essential components of just about every deck. Of course, as you get better, there are more things to look for: for instance, in multiplayer, Thief can be a threat to those who trash heavily, and Remodel significantly changes endgame play. But if you’re just starting out, it’s enough to keep in mind the Big Three, and learn what else to look for as you get more experienced. This is described more fully in the Gardens article. Any game with both Gardens and Workshop (sometimes Gardens and Woodcutter) is basically a Gardening race, and there’s rarely going to be an alternative strategy fast enough to compete. You needn’t consider Chapeling or deck-building, though Witching will be of some help. Without Workshop, Gardens are much less of a threat, and more of a last-minute desperation gambit if you are too far behind on Provinces and Duchies but have a fat deck. Naturally, they are near-worthless in Chapel games (see below). Chapel is the best card in the game, and according to Donald X., probably the most powerful card for its cost that will ever be printed. 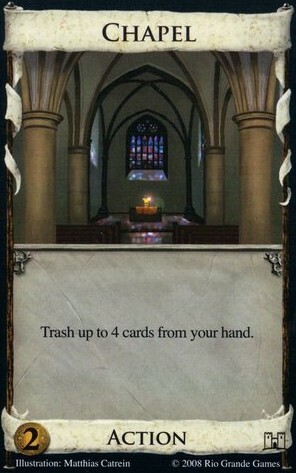 No matter what you’re playing (except for Gardens games and Smithy-Big-Money, described at the bottom), a Chapel will speed up your deck by clearing the chaff. It’s easy to play with Chapel: trash as many Coppers, Estates, and Curses as you possibly can, at every opportunity. The effect on your deck is miraculous. The only other true trasher in base Dominion is Moneylender, which is much slower than Chapel. It’s still an important card, but not nearly as game-changing as Chapel. 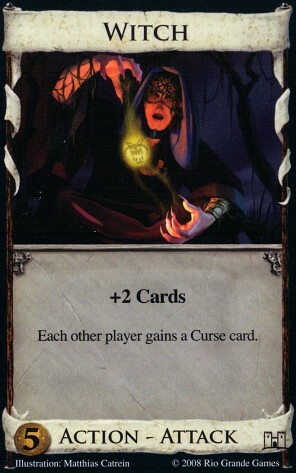 No matter what kind of deck you’re playing, you will benefit from buying a Witch and playing it as often as possible. Moat and Chapel are simply not sufficient defenses against the onslaught of Curses. Cursing attacks are the strongest attacks in all of Dominion, and no matter how many expansions you are playing with, or how experienced you are, it is imperative to grab them as soon as you can. You can occasionally incorporate the Witch and its +2 Cards into a +Actions/+Cards engine (as described below), but the attack is sufficiently strong that even if you have no Villages or Festivals, it’s worth risking drawing Actions dead in order to play the Witch. There are three main kinds of decks in base Dominion. You can mix and match the first two, but Big Money tends to stand alone. This generally means a deck built around Laboratory. In later expansions, other cards are also viable to build a non-terminal engine around, but in the base game, Laboratory chains are the best route to a big hand, because they do not suffer from the harms of +Actions/+Cards engines described below. In a particularly dense (i.e., thinned out with Chapel) deck, you can make do with a Market chain if Laboratories aren’t available. But Laboratories are generally preferable, since 1 card is generally worth more than $1 and a buy. Assuming your primary engine card is Laboratory, you have room for a single terminal Action if you draw your whole deck every time. This slot is best reserved for Militia or Witch; otherwise, Remodel, or possibly Woodcutter if you need +Buy, are good options. If you want multiple terminal Actions, you can mix in a few Villages or Festivals (or Throne a Laboratory), but you need to keep up on buying the Laboratories, which are the key to getting this deck running. Cellars are also vital, since they save you if you find yourself drawing into a sea of Green. The biggest drawback to a Laboratory chain is that it doesn’t actually net you any money, it only draws you cards. So you’ll have to mix your Laboratory purchases with something that gives you money: preferably Markets or Gold. Since you’ll (hopefully) be drawing so well, you should make sure to grab a source of +Buy, because if you balance your Gold and Laboratory purchases, you can easily hit $13 (enough for Province + Laboratory, which keeps your engine rolling even as you buy Provinces and clog your deck) or $16 (for a double Province). Building these engines is described in great detail here. In the base game, your +Actions are going to come from Village or Festival, and your +Cards are going to come from Smithy, Library, or Council Room. Festival/Library works quite well, but takes longer to set up and relies more heavily on trashing. Village/Smithy is simpler, but doesn’t have any source of money or +Buy. Council Room’s drawback seems like a big deal, but it usually isn’t, and in any event you can use a Militia as a “kicker” to negate the benefit you provide to your opponents. Like the Laboratory chain, you’ll want to make sure you can get a source of +Buy, because there’s no point in building an elaborate engine that draws $20 every turn only to buy Provinces one at a time. 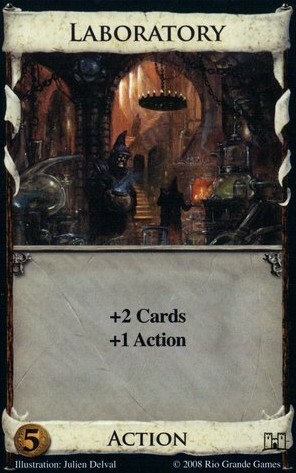 And like the Laboratory chain, a Cellar is critical to help reduce the chance of a nightmare draw. These are generally more difficult to put together than Laboratory chain, because the order in which you draw your cards matter, and so it is more vulnerable to your opponents’ Cursing attacks. This is sort of the baseline for advanced play, and represents the core difference between an expert’s deck and a novice’s deck. Good decks have no difficulty beating Big Money and Smithy Big Money; most beginners cannot. Later expansions have further weakened this “strategy”; see Beyond Silver. In any event, you should use it as a guide for how you’re doing; in a game with no attacks, Big Money averages 4 Provinces by Turn 17, and Smithy Big Money by Turn 14. If your deck can’t do better than that in the absence of attacks, you should rethink your deck. So how do you start? First, check if there are Gardens and Workshop on the board. If not, and if you started with a $4/$3, then if Witch is available, then you should buy a Feast (if available) to get the Witch ASAP. Likewise, you also want a Chapel if possible (even if it means overpaying for it on one of your first two buys); if neither Witch nor Chapel is available, then Moneylender, Militia, and Silver are all fine cards to open with. If you had the good fortune to open $5/$2, prioritize Witch and Laboratory. If those aren’t available, any of the other $5’s are OK, though Council Room and Library are probably only going to be good if you plan to build your deck around them later. You should hopefully have an idea of what kind of deck you’re going for. Stick to your plan: don’t branch off and get random Actions because they look cool. Remember that with few exceptions (Market, Festival), you need to be buying Treasure for your engine to be drawing: the best Laboratory chain in the world only draws you cards, and you need money in those cards to make it worthwhile. When do you start buying Provinces? Generally, as soon as possible. There are exceptions: if your Lab engine is set up and you’re drawing $10 with multiple buys every turn, you might want to take a second to get a Gold, so that you can be drawing $13 every turn, which is far more helpful because then you can go Province/Lab every turn. Alternatively, maybe you want to push for $16 and gun for a double Province turn or two. It all depends on how fast your opponent’s deck is going: watch his tempo, and don’t get caught with your pants down and too few Provinces remaining. When do you start buying Duchies? 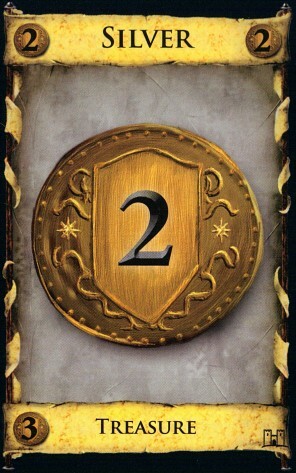 Again, it depends on your deck: if you have Cellars or maybe Spies, then you can buy them earlier than usual. But generally, I start buying them in a 2-player game when there are around 4 Provinces left. A good rule of thumb is to always buy green cards before you think you need to. This entry was posted in Articles, Dominion. Bookmark the permalink. When we first started playing Dominion in our area, my wife was a Duchy ninja. She won a huge majority of games by sneaking in and grabbing Duchies, while the rest of us were playing with our Markets/Mines/etc. We focused too heavily on Provinces and underestimated just how a few Duchies can tip the scales. Estates can serve as tiebreakers, but they can also clog your deck, even toward the end. I generally buy Estates when I have 0-1 shuffles remaining (and I really am uncomfortable with having 1 shuffle remaining). Although, unless I am taking advantage of a +Buy or the Duchies have run out, being forced to buy Estates is a sign that my deck is clogged up. If that’s the case, then Provinces aren’t really much of an option for me (and hopefully for the other opponents), and buying out Estates and/or Gardens really is the best course of action. I’ve gotta say, “Duchy ninja” makes a pretty good player name. But your simulations don’t take the reshuffle into account, do they? This is really really important when trying to decide whether to buy green or not. Probably the 5 provinces is a good rule if you’re worried about what cards are left only, but knowing your deck’s composition is really important. If I’m pretty sure that between my opponent and I, we’re not going to make it through another reshuffle of my deck, I will buy only things that help my VP bottom line, even if I have 7 and the duchies are gone and I’m buying an estate, with a few corner exceptions. Conversely, if you’re close to a reshuffle and you know your opponent is 1/2 way done and has already spent all his/her golds and good stuff, perhaps you should hold off on buying a duchy even with four provinces available. Thank you so much for this base Dominion guide. I’m sure that a majority of those who regularly look at this site are more experienced players, but information like this is extremely valuable for helping newer ones to appreciate some of the nuances of the game. My wife and I have been playing Dominion for the past 6 months, and we both love it. Through trial and error, Board Game Geek, and this site, we have been able to become pretty good players. ( I don’t know what my level would be since I don’t play on Isotropic, but I think that I would at least be in the middle of the pack. I believe sometimes that I wait one or two turns too long before buying the green.) My wife has always enjoyed playing board games, but I have never seen her want to play a game as much as Dominion. Since we have found it so enjoyable, we have been trying to get others interested in the game I am printing this discussion and I plan to use it to teach newcomers the game. I am really looking forward to the series you mentioned at the start of the post. I also really appreciated the comments on some of the cards in Cornucopia over that past couple of weeks. Thank you very much for this great website and thanks to all of the experienced players who provide addtional comments and insights in their responses. Note that buying VP cards earlier than you think only comes with a fair amount of experience or knowledge or wisdom – I’ve seen players open with estates, and this is never the right play, at least with the cards that are out now. No 5s on a board with Baron, a bunch of 3s, 6s, and 7s and no 2s and you have 5/2? Open Baron/nothing or Silver/nothing or one of the 3s/nothing and realize that this is incredibly bad luck but don’t get that estate! (okay, there are probably some cases where you can grab it, but they’re super super super rare – probably less than 100 combinations of the trillions that are currently out there). That raises an interesting question about the Baron – does Baron beat Big Money? If so, how often should you take extra estates? And how many Barons would you need? Baron accelerates any expensive strategy by giving you a good shot of getting to Gold in round 2. After that you need to draw a lot of cards to insure that Baron connects with an estate. Adding additional Barons or estates is usually a bad idea although if you have a powerful enough draw engine and no way to trash there might be situations where it becomes useful, particularly with a need for + buy. However, if you can buy Baron in the late game you can probably buy Gold and the Gold, while worth 1 less, can’t miss. My preference is to start buying green cards as late as possible, risking too late rather than too early. But I think this is a personal preference since I tend to build explosive combo decks which keep getting better the more good stuff you add (and the less green). For beginners, it’s harder to go wrong buying provinces whenever you hit $8. I look forward to more comprehensive strategy articles like this. I know they’re not easy to write, especially as expansions make the strategic options more numerous, but your time and effort are very much appreciated. I have a question about Militia defense. We were introducing some new players to the game the other day and played a three player game with the recommended base starter set. Having internalized somewhat your distaste for reaction cards, I disdained getting more than maybe one Moat, but found myself repeated flummoxed by the Militias, and unable to really get my deck going. One opponent though bought several Moats and got a surprisingly good Village chain going using the Moats for their modest draw as well as to ward off the Militias, with maybe one Smithy and some Markets thrown in. You don’t discuss Militia much in the main text: what are your thoughts on how to deal with it, in the base set or in general? 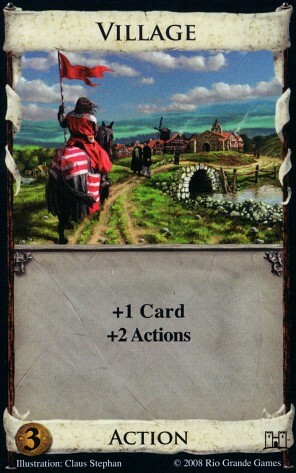 Smithy (+village/festival) and Library are both good base-set counters to Militia. Alternatively, Chapel down to a small, but strong deck. Who cares if you have to discard down to 3 cards when you hold Gold, Gold, Gold, Silver, Silver? You’re still going to be buying that Province. i.e. how did you come up with these numbers, how accurate they are, etc. Big Money takes and average of 17.8 turns to reach 4 provinces, Smithy Big Money takes an average of 15.9 turns. I would like to know whether my current (simple) algorithm is inefficient and I should look for ways to improve it, or whether your data is a slight underestimate. Please let me know how accurate your numbers are.